I love making all kinds of veggie chips. Sweet potato chips and zucchini chips are my fave. 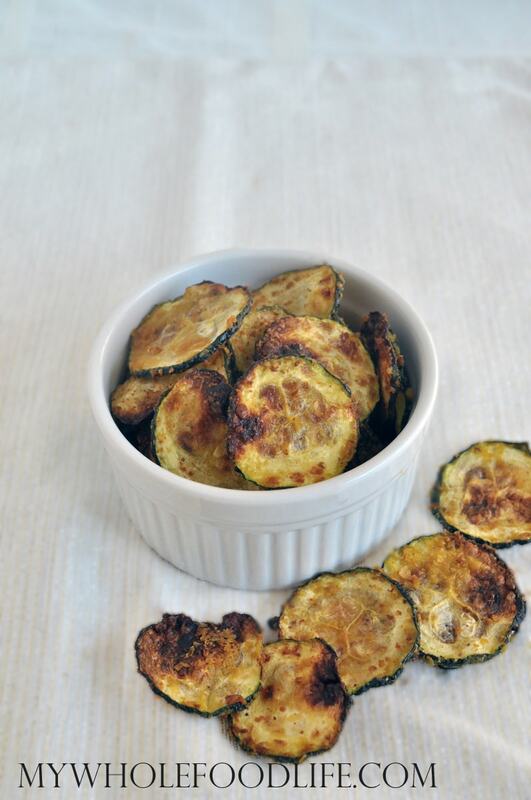 Well this recipe for Cheesy Zucchini Chips will definitely be a new fave. They are delicious, easy to make and dairy free! I call them cheesy chips, but there is actually no cheese in the recipe! I used nutritional yeast, which has a cheesy flavor. It went so well with these chips. In case you were wondering, nutritional yeast is nothing like bread yeast. You can read more about it here. If you eat dairy, you can use some regular cheese if you like. This can also probably be done in the dehydrator as well. It might take about 12 hours to do that though. Slice the zucchini thin. I used a mandolin . Place in a bowl with the remaining ingredients. Use your hands to toss the zucchini around in the bowl until each one is coated. 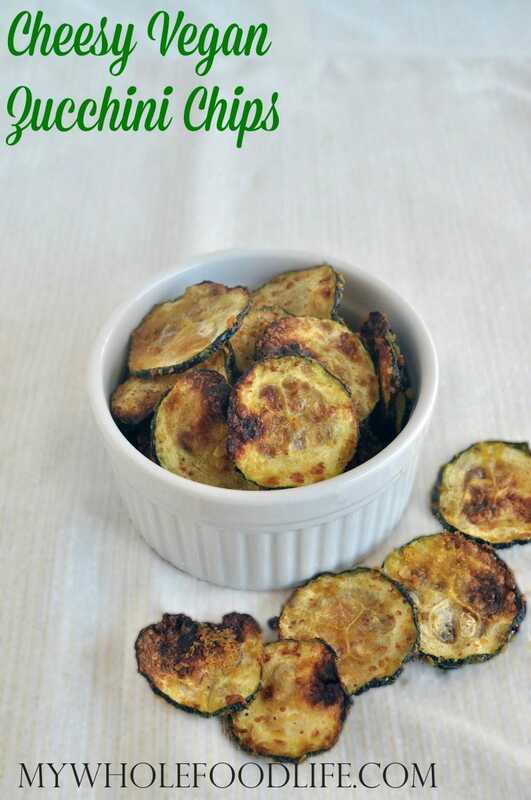 Place the zucchini chips on a lined baking sheet . Bake for 15-20 minutes. Remove, flip the zucchini and bake again for another 5-10 minutes. If you have any left to store, place them in an airtight container with rice scattered at the bottom. The rice will absorb some of the moisture and keep the chips crispy. Enjoy! If it was 9 a.m. instead of 9 p.m., I'd be in the kitchen right now trying these out, they look so yummy! These look so easy and delicious! I will definitely be making these for my fiancé. Thanks, Melissa! Yummmmmm. I LOVE nutritional yeast, so I figured I would like these, and I was right! I baked some on a parchment-lined metal pan, and some on a baking stone. The ones on the stone crisped up quite well, whereas the others did not get quite like a chip. That didn't stop me, my daughter and my husband from gobbling them up like they were going out of style. Yeah ... tip for storage not needed. :) I'm so happy about this, because my daughter hasn't liked nutritional yeast in the past, but she loved these! My husband said, "That's the best use of that stuff yet." Yay! Thanks for yet another winner of a recipe! Yay!! My kids liked these too! Glad they were a hit! I slice my zucchini thin; like said. But then the slices burn black after 5 min's. Thoughts? Because I'm certain I'm missing something. Sorry that happened to yours. :( Maybe the oven runs hotter than mine?